Trump's envoy responds to comments made by Qatari official that cooperation with Israel is needed in order to improve the situation in Gaza. Jason Greenblatt, the United States' Special Representative for International Negotiations, on Friday reacted to comments by a Qatari official who acknowledged in an interview with The Associated Press that cooperation with Israel is needed in order to improve the situation in Gaza. “Qatar partnering with Israel can bring real relief to the people of Gaza. Ending support for Hamas and focusing on humanitarian aid and reconstruction will end the suffering,” Greenblatt wrote on Twitter, alongside a link to the AP interview with the Qatari official, Mohammed Al-Emadi. "When you want to do work in Gaza, you have to go through the Israelis. Without the help of Israel, nothing happens," Al-Emadi, the head of Qatar's Gaza reconstruction committee, said in Thursday's interview. "This is part of our effort, working very closely with Israel, very closely with everyone in Gaza, to prevent any more escalation and war. We want peace in the region, and to help the people," he added. Over the years, Al-Emadi said he has developed a cordial relationship with the Israeli Coordinator of Government Activities in the Territories (COGAT), Maj. Gen. Yoav Mordechai. "You can say it's good," he told AP, stressing the motives were pragmatic. "To help the people of Gaza, this is our only target and aim," he said. Qatar and Israel have no formal diplomatic relations, but Qatar is one the countries providing aid to Gaza. Greenblatt has several times taken to Twitter in the past week to criticize Gaza's Hamas rulers for spending the funds they receive to build terrorist tunnels instead of allocating those funds to help the people of Gaza. “Hamas literally undermines Gaza’s chance for success— now building a terror tunnel under a crossing to Israel that should be a conduit toward a better economy,” he wrote last Monday. “A terror tunnel costs roughly $5.9 million to build ($ that belongs to the people of Gaza) plus roughly $30,000 a day in lost revenue when the crossing is closed as a result. Gaza needs options besides Hamas and its enablers. Time to stop pouring money into violence and hatred, and to start investing in a real future for Palestinians in Gaza,” added Greenblatt. 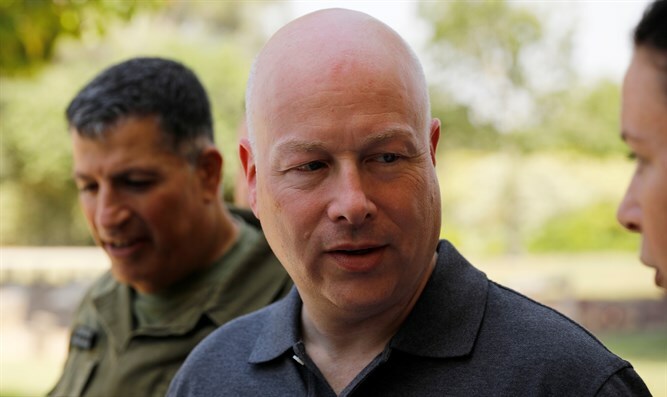 Earlier this week, Greenblatt blasted Hamas, as well as Iran which sends funds to the group. “Hamas should be improving the lives of those it purports to govern, but instead chooses to increase violence and cause misery for the people of Gaza. Imagine what the people of Gaza could do with the $100 million Iran gives Hamas annually that Hamas uses for weapons and tunnels to attack Israel!” Greenblatt tweeted. “The corrupt regime in Tehran squanders the resources of the Iranian people on military adventures throughout the region instead of investing at home and promoting peace abroad,” wrote the American envoy.